Who Are Elm House Tree Services? 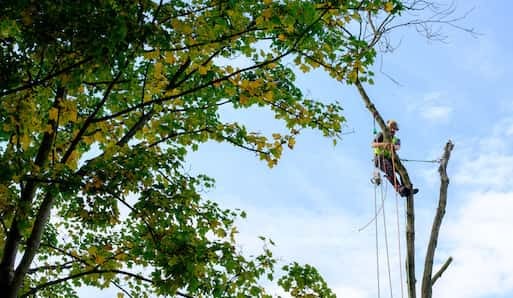 We are friendly tree surgeons in Urmston who have a combined experience of over 30 years. Andrew Hampson runs the business and carries out work with his highly skilled team. We are a friendly company who offer friendly advice and complete work to a high standard. We are fully qualified and insured so you can be sure you are getting the best quality available. We like to be competitive against other tree surgeons in Urmston when it comes to price so we put our best quote forwards first. If you need a quick response then you are in the right place – we offer a quick response time to all contact made to us. We are City & Guilds NPTC qualified so you know we are up to the job. We always have the tools, we always have a plan in place. We get the job done quickly, but with no compromise on quality. We always deliver what you ask for and leave the area tidy. We never dump our left overs, we always dispose of them in the correct manner. We are competitive on price & are open to price matching. We have a wide knowledge and can deal with whatever is thrown at us. We are approachable and friendly whilst getting the job done. If you are looking for a tree surgeon in Urmston then you’ve come to the right place. We are trustworthy and competitively price which means that not only do you pay a decent price, we also do the job properly. Each job we do has to be individually quoted for as the variables are different for each job. When we turn up to a job to quote, we look at the size of tree or hedge, what other trees or plants are around that need to be looked after in the process and also look to see how easy or difficult it will be to get our machinery to the site. Sometimes we will struggle to get through thin alleyways or across difficult ground and may need to lift it over walls or any other way that is a safe approach. A tree surgeon in Urmston can vary in price but we put together our best quote possible. The below guide will give you a rough idea as to how much we charge for different jobs – please don’t forget that we will quote for your job individually and that this really is, just a rough guide. Stump Removal – £70+VAT. Why not read our handy post: “How Much Does Tree Stump Removal Cost” with more in depth information. We are safe tree surgeons and are all City & Guilds qualified tree surgeons. This ensure that we are both knowledge and carry out safe practice when dealing with potentially dangerous machinery and sizeable trees or hedges. Our qualifications gives you (and us!) the confidence that we are safe and knowledgable. We have deep knowledge when it comes to tree and plant species and we can therefore give you good advice on how we will remove trees or plants so that they won’t return, or we will trim them so that they will not become damaged and potentially die. If you are going for a trim, we will advise you on when is best for us to come and do the job to give the best possible change for the tree or plant to live. When we turn up, we are professional and friendly. We understand what it can feel like to have your private home or commercial property disrupted by loud noise and workmen. We try to keep noise levels to a reasonable level and we are courteous to those around us. No grumpy workmen, we love what we do and will turn up with a smile on our faces! We care about our customers and we therefore always endeavour to return calls, emails and texts so that you know what is happening with your job at all times. We are always happy to answer all questions at any time. Why not get in touch with our friendly Urmston tree surgeons today! Are you looking for a tree surgeon in Manchester outwith the Urmston area? We serve many areas across Manchester.